1. Planxty No.12; 2. Miss Hamiltons / Logier's Hornpipe; 3. The Poor Soldier Boy; 4. Gladstone's Bill / Reel No.254 / The Well-Humoured reel / Lady Elizabeth Percy's; 5. Loch Earn Quickstep / O'Connells reel; 6. Walk On The Darógs / Jacksons Mistake / Morgan Rattler; 7. Air No.39; 8. The Rights Of An Irishman / The Humours Of Ballingarry; 9. The Fourth Dragoon's March; 10. Stephen Grier's Polkas; 11. The Raven Wood waltz; 12. Arky's New Building / The Duke Of Gordons Birthday, A Ha'Porth Of Tea; 13. The Straddy / The Humours Of Bantry Bay / The Maid Of Hide / The Races Of Granard / Peggy On The Hill; 14. Roslin Castle; 15. Miss Dunbar / The Primrose Girl / The Garland House; 16. Burns Farewell. Every few years a CD comes along that just stands head and shoulders above the average and the 1990 release by McGuire and Lee The Missing Reel was one of those. We've waited nearly 30 years for a follow up and the long wait has been well rewarded. This CD is simply superb; old Irish tunes played with ease by great players, well recorded and supported by a comprehensive and informative booklet. Fiddle player Seamus McGuire is a member of the group Buttons and Bows with his brother Manus, box player Jackie Daly, and Garry O'Briain who plays mandocello, guitar and piano on this CD. Seamus recorded an LP with his brother back in 1977 and a solo CD in 1994. His Sligo roots and family connections helped him develop a fiddle style that marks him out as a master of his art. To say John Lee is a flute player from Leitrim would be too simplistic. He is an expert in the history, repertoire and flute playing style of his native area who has collected a vast store of local tunes and settings. It was his driving flute style and rare local tunes that made The Missing Reel such a treasure. 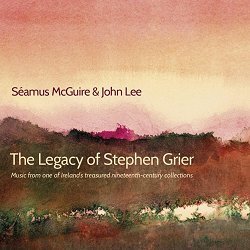 The theme of this CD is another aspect of John's interest; the manuscript collections of Stephen Grier. Born in Longford in the mid 1820s, Grier married and moved to Gortletteragh in South Leitrim in 1852. There is speculation that he might have been a piper or fiddle player, but what is known is his enthusiasm for the local music, which he collected and notated in 12 manuscript volumes from around 1880. On his death in 1894 the manuscript passed to a neighbour, piper William Mulvey who in turn passed it to a grandson, and so on to its present custodian who shared a copy with John. Some of these tunes survived in the local repertoire and John recognised them as tunes he had from his father, or local flute master John Blessing. The significance of the collection was recognised by Breandan Breathnach, the great 20th century collector and 64 of the nearly 1,000 tunes were included in the fourth volume of Ceol Rince na h'Eireann, published posthumously under the editorship of Jackie Small. A few Grier tunes were included on the 1998 McNamara family CD Leitrim's Hidden Treasure but the manuscripts have remained unpublished and the tunes unplayed for over a century. This release marks another stage in the growing interest in older tunes and versions. For many years, the collections of O'Neill and Breathnach were seen as the main sources of the standard repertoire. Petrie and Joyce were known but not given prominence. More recently the Canon Goodman collection of pre-famine music has been published and many old forgotten tunes were brought back into the session repertoire thanks to recordings by Mick O'Brien, Jimmy O'Brien-Moran and others. The tunes from Grier brought back into life by this CD shine a spotlight on the way music, in an essentially oral tradition, twists and changes over time and this CD offers a milestone on that endless journey. Without a doubt the musicians of the 1870s and 1880s who provided these tunes would instantly recognise their local repertoire, yet modern listeners can enjoy traditional Irish music of the highest quality without the history having any impact on their enjoyment. Many of the reels and jigs are recognisable but the settings are unique. The three jigs in the Walk on the Darogs set all have an air of familiarity, yet are different enough to be distinct from present day versions. The frameworks remain common but the little notes between have changed over time  sometimes for the better, other times the older versions are more attractive. Attribution also changes over time and the reel O'Connell's illustrates how names are changed. The tune seems to have come into common usage after it was recorded by De Dannan in the 1980s and called Charlie Harris's reel on CD and in session. Charlie himself calls it Creamer's and says his source was a Leitrim musician. John Lee's source is his father and John Blessing but the tune is noted down in book 2 of the manuscript almost exactly as played today. Interestingly, the McNamara family play the tune twice on their CD, once as O'Connell's and once as Michael Creamer's. It is also worth noting that many of the tunes presented either started out in life as Scottish imports or early 19th century airs and song tunes. The final tune on the CD is an early version of The Parting Glass dating back to the first half of the 17th century, later used to set Robert Burns' 1786 poem Farewell to the brethren of St James Lodge, Tarbolton to music and eventually used as the air for the present day song. The refrain has remained almost the same throughout this evolution. The CD and the tunes might be seen as mere curiosities, only for the serious enthusiast, were it not for the quality of the musicianship. The players let the music speak for itself, there are no egos on display; yet, their skill, empathy and, no doubt, a lot of hard work go into making the playing sound so easy and engaging. Sympathetic and understated accompaniment from Garry O'Briain, and Floriane Blancke's harp on a couple of tracks, provide a framework for the two players to explore the old tunes. Seamus plays a couple of slow tunes on Viola which are simply wonderful as the tonal quality of the instrument lends itself so well to the mood of the airs. The mix gives each instrument a clean voice with no one instrument dominating and the ensemble provides a very enjoyable sound. The programme is well considered too; slower tunes, song airs, polkas, a march and a planxty break up the jigs and reels. There's limited instrumentation but the varied use of accompaniment as well as solos from the two tune players keep the listener's interest. As a result it's very hard to stop the CD before the 46 minutes have played through. The dance tunes are taken at a steady but bouncy pace, in keeping with the Sligo and Leitrim style, and the jigs and reels selections are played through usually only twice before changing. This is a recording to return to. Repeated listening reveals more twists in the tunes and depth to the musicianship and playing. The accompanying booklet, illustrated with pictures of the manuscript provides an in-depth analysis of the tunes, sources, contemporary and later published versions as well as personal and historical anecdotes. A brief history of Grier and the manuscript are provided by Conor Ward, and Jackie Small and Fr John Quinn also contributed to the notes compiled by Seamus. Available from the musicians' own website https://mcguireleemusic.com/shop/ this CD is already our highlight of 2018 and should appeal to a wider audience than just those interested in traditional Irish music.